Measuring Partial Discharge (PD) activity online is nowadays widely accepted by electrical engineers worldwide for assessing the condition of live MV and HV assets. Its importance is particularly acute in an era of capital constraint and growing pressure to ensure the safety, reliability and performance of ageing assets. The interpretation of PD readings has traditionally relied on experienced engineers and technicians. They alone have been able to judge if a PD measurement indicates real problems. 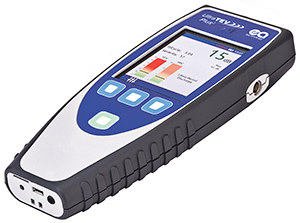 EA Technology has developed what they believe is the first truly smart handheld PD instrument – the UltraTEV Plus2. Like previous UltraTEV instruments, it measures PD in the ultrasonic and TEV ranges. The principal difference is that it now embodies sophisticated algorithms which interpret PD measurements automatically and tells the user clearly what they mean in real terms. Essentially an operative at any level can use the UltraTEV Plus2, and instantly access the knowledge of hundreds of engineers with decades of experience. The world has come a long way since EA Technology launched the first multi-sensor PD handheld in 2003. Like the mobile phones of its day, the UltraTEV Detector was effective but limited by modern standards. With the UltraTEV Plus2, PD instruments just got a lot smarter. This entry was posted in News and tagged Instrumentation, Measurement, Testing. Bookmark the permalink. ← Keeping the World in Go!